"Iriyatesse... Iriyatesse. Restore your hidden power to this time and place. Iriyatesse... Iriyatesse. Restore your hidden power to this time and place. Spirits of forest... through silent moonlight, through streams and rivers, awaken the ancient totems hidden deep within Asuka and restore our sacred alter." The third volume of Nazca brings all the key figures in the play together and gives a glimpse of what is to come when the final battle must be waged. In Episodio 7: ‘Memory...Separate Ways,' Aquira's past is reviled at last as the threads of fate tear her apart from her childhood friend Bilka and her betrothed Yawaru. Episodio 8: ‘The Promised Land' features the high-point of the third volume as Shiogami and Kyoji fight a brutal battle inside the Nazca lines of the spider. It's life or death for Kyoji as he must play the defensive against the true power of the Moon Warrior Jigumi. A good show entertains you, but a great show makes you believe what you are seeing. Nazca can be classified as one such show. The ancient culture themes that are presented in Nazca are shown in such a way that you know it is fiction. Yet, it captivates you to keep watching, much like Neon Genesis Evangelion made you fall in love with the characters, but hooked you with the religious conspiracies. For this reason, the flashbacks to the Incan Empire become the ties that bind the series together by the by the actual places. Much like the historically accurate flashbacks in Highlander: The Series. Spawned from the Pioneer/Bandai partnership, the box design for the Nazca series has a clearly unique design that features an earthtone color scheme with transparency and layers to give a sandstone feel to the covers. Betrayal of Humanity's box is the most interesting of the series so far, because the back cover features a stunning half-face shot of Aquira with her head-dress on. The art literally has streaks that flow into the pictures on the box which appear to fade in and out as if they are glimpses into the future which the warriors will share. And what about the DVD features? Well, it is more of the same that was seen in volume two as the box art comes alive with the standard fare of Pioneer features: scene access, bilinguals language tracks, subtitle access, and DVD credits. Plus, the mini-manga shorts are back with two more installments by Dr. Morrow and Studio Kotobuki. If you thought the first two installments where fun, then be prepared to laugh yourself silly as the reincarnated Incan warriors head out to a retreat to bring about Iriyatesse. All the while Shiogmi torments the crew and his ‘cackling' and mannerisms are just plain hilarious. Memories, Promises, Darkness. What more can an Otaku ask for? 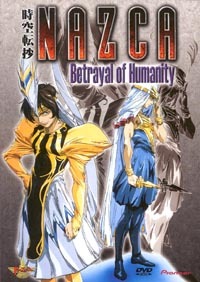 Nazca Vol.3: Betrayal of Humanity has it all. And it's all leading up to the no-holds-barred conclusion. Expect nothing less from the conclusion. Until then, I have just one thing to say -- "Doru Akurusu Yagu Uwaru." The most engaging volume in the series up to this point.